View the visitor information from SugarCRM. View the statuses of each lead or contact. 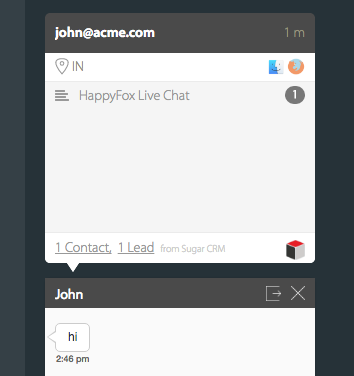 Create leads or contacts in SugarCRM after chat ends. The chat transcripts will be updated under Calls for Leads and under Cases, Calls for Contact depending on your preferred settings. 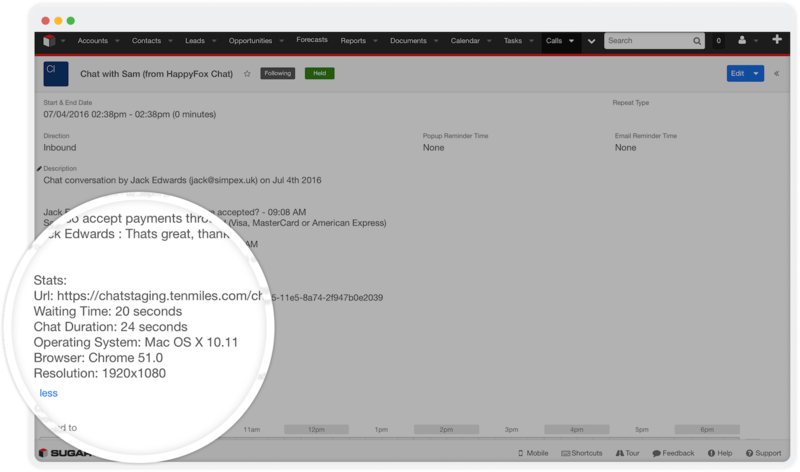 SugarCRM integration is available from the Fantastic plan and above. Only admins of the HappyFox Chat account can set up this integration. This integration is supported from SugarCRM version 6.5 and above. Enable read and write access for leads, contacts, activities and cases. Read access for calls and messages. Step 2: Go to Apps and Select SugarCRM. Step 3: Click INSTALL/TRY FOR 7 DAYS button. 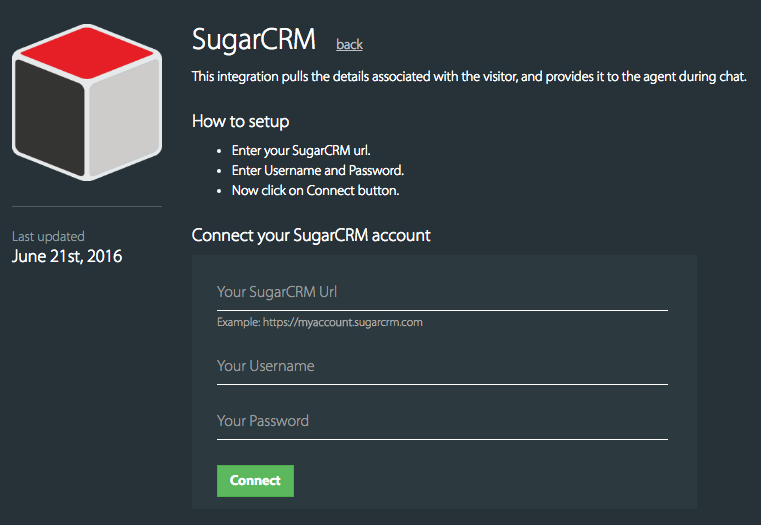 Step 4: Enter your SugarCRM URL, username, password and click Connect. You have now successfully connected your SugarCRM and HappyFox Chat accounts. Step 5: Now, update your preferences under settings and Click Update settings. 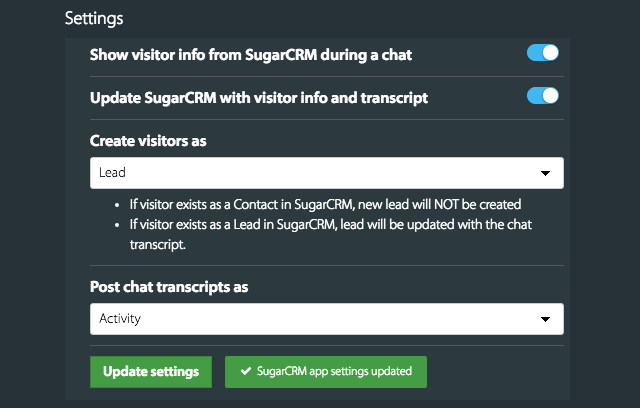 If visitor exists as a Contact in SugarCRM, new lead will NOT be created. 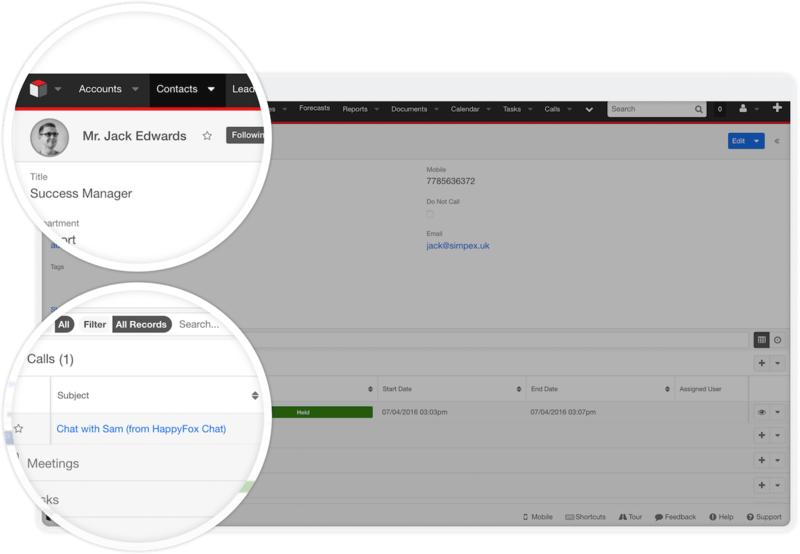 If visitor exists as a Lead in SugarCRM, lead will be updated with the chat transcript. 2. 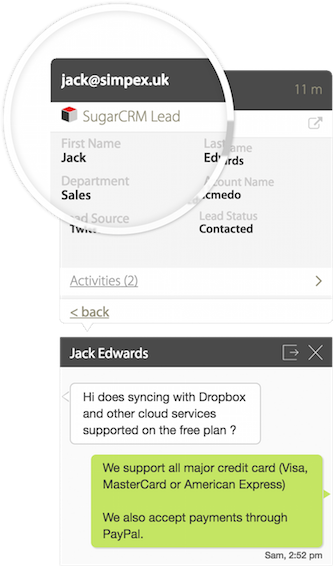 Create leads or contacts in SugarCRM after the chat ends. 3. View the statuses of each lead or contact. 4. The chat transcripts will be updated under Calls for Leads and under Cases, Calls for Contact depending on your preferred settings.